With the recent ascendance and mass embrace of Snarky Puppy, there may be a tendency by some to superficially assess The Funky Knuckles as SP redux. This would be a mistake. Yes, they both have a similar instrumental footprint and stylistic aesthetic, hail from the same Dallas scene and are even label mates, but it might be akin to dissing Albert Collins because there's BB King. The initial resemblance is there, but both have their own unique game faces. Plus, in reality, the stylistic similarities run only so deep. It is doubtful that, after being reasonably acquainted with both bands, there would be any real danger of attributing a song to the wrong artist. 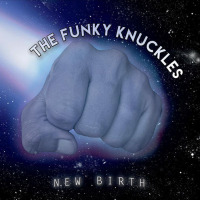 Succeeding 2014's solid Meta-Musica, The Funky Knuckles third album, New Birth sheds an even brighter light on the band's individuality and growing masterytheir instrumental prowess sharper, their compositional adventurousness bolder. As with their previous releases, New Birth is interspersed with musical snippetssonic amuse bouches or palate cleansers if you willthat punctuate the multiple courses. The opening sound collage "Ced's Tune" however, serves as an aural invitation to the New Birth house party and sets an initial relaxed tone to the proceedings. This is ironic for while it seemingly begs the listener to come in, hang loose, and enjoy some tunes, almost immediately the band's performance conveys an opposing attitudeone of unrelenting tightness. Even in the subsequent loping groove of "Wise Willis," there's an innate surgical precision that is ever-present. And from there it's even more evident that the Knuckles are not your father's groove-oriented, Jazz/Funk band. They are one well steeped in the musical and textural syntax of Contemporary R&B and Funk to be sure, but also one that successfully delves far outside those generic confines. From the overlaid African influences and chamber-like sections on the title track to the Mehliana-ish base matrix of "Peculiar Place," there isn't much that would be declared out of bounds for this band. It's also perhaps their stylistic grounding in Funk / R&B that allows TFK to take heady excursions worthy of a straight-up fusion band without putting them squarely into the cerebral zone. In addition to creating a nice balance, full blown poly-metric odysseys like "Me Too" and rhythmic barn-burners like "Moorish" sit comfortably next to more chill tunes like "Globule" and "Captain Sandals." This may be in part because the simpler tunes are never devoid of at least a subtle complexity and the statistically dense ones are in turn honed to a more eloquent edge by a pithy contemporary sensibility. This coupled with the album's impeccable production values heightens the listening impact of "New Birth," creating a substantive musical offering deserving of attention. With this album, it is also evident that the Knuckles are continuing to forge a group identity that supersedes individual contributions. That's not to say there aren't plenty of stand-out moments provided by the individual players. There certainly are but it's the "lock"(both stylistic and rhythmic)created by the band members that gives New Birth its punch and makes The Funky Knuckles a collective entity truly greater than the sum of its talented parts.